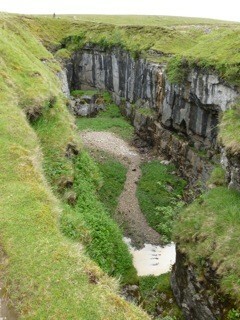 We are just back from our first ever long weekend of guided walks in the Yorkshire Dales. Our aim was to climb the three highest mountains in Yorkshire over three consecutive days, taking it slowly to allow time to enjoy the views and look at points of interest along the route. Yesterday following our descent from Pen-y-Ghent, we passed Hull Pot. A collapsed cave which now forms a hole in the ground approx 60 feet wide, 60 feet deep and 300 feet long. It is rumoured to be Britain’s biggest natural hole. A stream enters the hole part way down creating a small waterfall and I believe that after prolonged heavy rain it cascades over the rim of the hole from the top as a much more impressive waterfall. On Friday whilst walking down beautiful Wolfscote Dale and Biggin Dale I couldn’t resist the temptation to explore some caves on the side of the valley that looked rather inviting. The White Peak, limestone area of the Peak District has numerous caves systems, many of which were carved out thousands of years ago by underground rivers forcing their way through, and eroding the soft limestone rock. The first that I explored was at the entrance to Wolfscote Dale. It was a bit of a scramble to get into it. The limestone at the entrance was polished to a smooth sheen from the hands and feet of thousands of people who must have been there before me over many years. It was just a small chamber with lovely views over the valley from the entrance. It struck me that it would make an ideal spot to eat a picnic lunch on a wet or windy day! The second was part way up Biggin Dale, and I have now discovered that it is a man-made trial passageway created for lead mining many years ago. There were some wonderful spiders webs hanging from the ceiling.